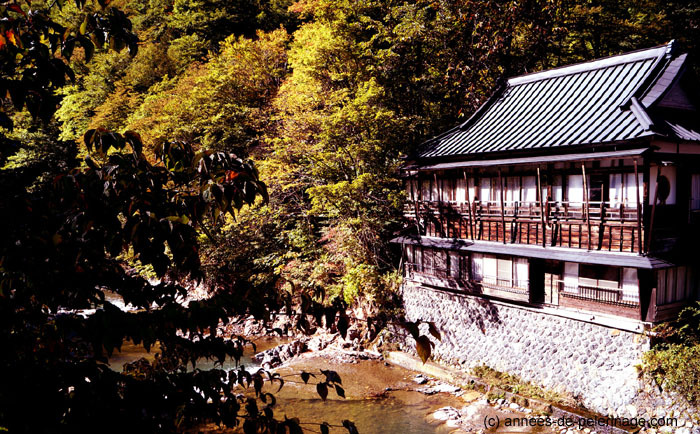 A review of the hot spring resort Takaragawa-Onsen in Minakami. With its huge outdoor pools it is frequently refered to as the best onsen in Japan. I doubt anyone ever counted all the hot springs in Japan. 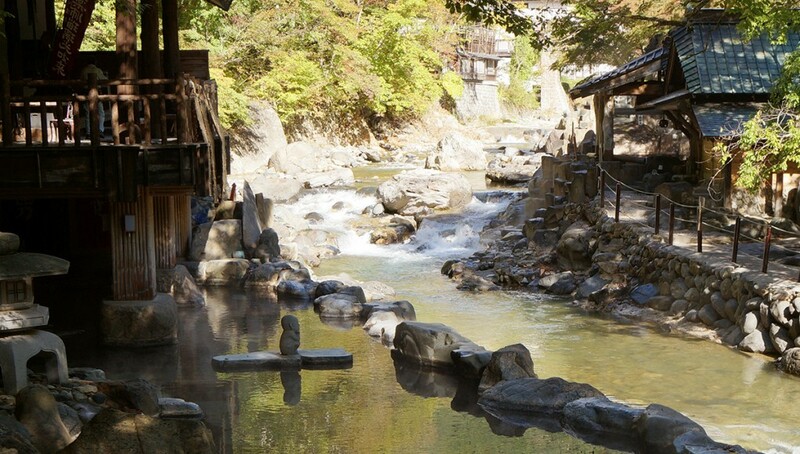 Yet there is one thing all will agree on: there is probably not a single village in the whole country that doesn’t have at least one onsen (温泉). 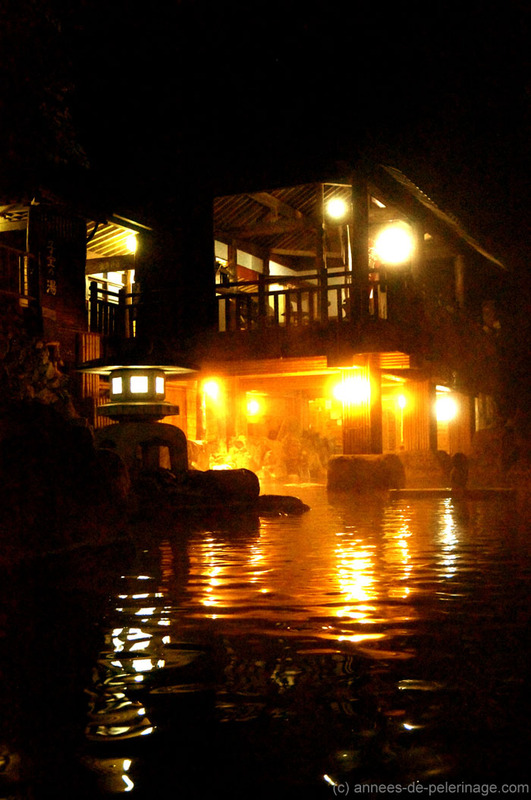 Onsen, which translates to hot water, are an inseparable part of Japan’s culture. No trip to Japan should thus do without immerging yourself in the steaming pools. 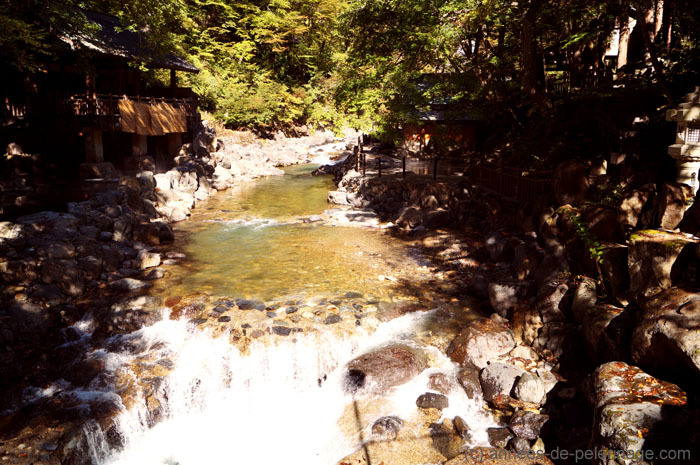 I’ll show you the best onsen I ever have been to – Takaragawa-onsen near Minakami! My first time at Takaragawa-onsen was one and half years ago – right after a week in Tokyo. My reasons for my decision back then are just as valid today: The pictures I found throughout the web were very convincing, the resort is quite close to Tokyo and they have those stunning outdoor pools scatters all around the banks of a beautiful mountain stream. Note: I get commissions for purchases made through links in this post. I had no association with the Onsen hotel whatsoever when writing this review. My opinions are my own, as was the money that paid for my stay. 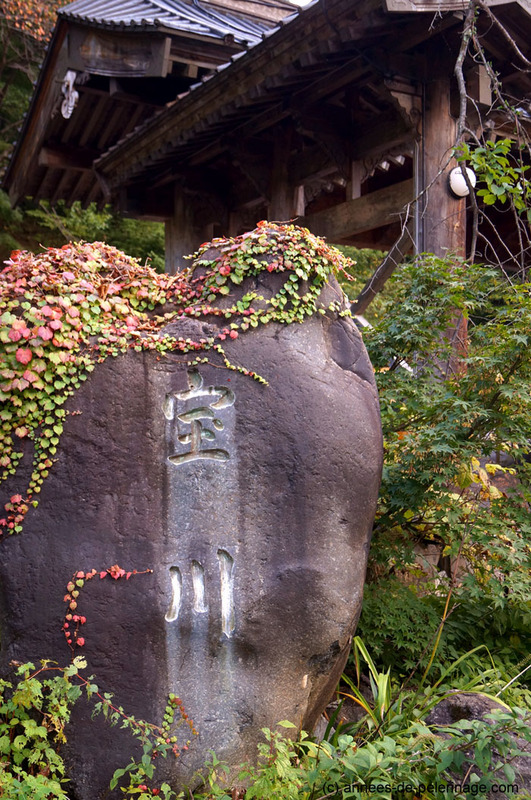 Takaragawa-onsen is located near Minakami, in Japan’s Gunma prefecture. Japan is a train country, so getting to the mountainous hinterland was really no problem at all. A pleasant ride of roughly 75 minutes dropped me out at Minakami Station – right on schedule with not a second spare. From there a hotel bus took me to the Ryokan. I admit to having been worried a bit in advance, but the friendly driver was waiting for me and my heavy luggage right on schedule, without the slightest problem. It was around 2 pm when I stored my suitcase in one corner of the comparably big tatami matted room, hastily strapped on my yukata and went exploring the complex. Sadly my room was located in one of the newer outbuildings that added concrete charm from the 1970ies where the old Ryokan impressed with tranquil wooden colors. To tell you the truth I was actually a bit pissed. On the website everything looked beautiful and pristine. The reality was somewhat more mundane. If you decide to go there (and you really should), I recommend you to get a room in the old building. These are absolutely stunning and you will get the real Japan-deal. Talking about stunning, you might also want to check out my review of Tawaraya Ryokan in Kyoto. Probably the best hotel in the world, so prepare for some serene pictures! 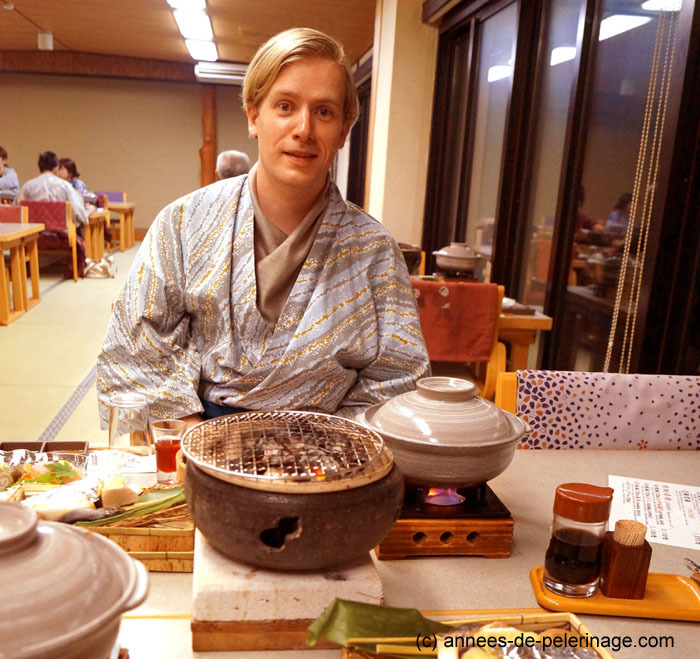 After my initial shock, I was quite glad to find the actual onsen to match – or maybe even exceed my expectations. A small hanging bridge led me over the lively mountain stream to the many steaming pools along its banks further downstream. I read a few reviews on the internet stating there was some flea-mark-like dump along the path. Much to my relief, all clutter seems to have been carried away long ago, leaving a picturesque path lined with old moss covered trees. A walk of maybe 100 meters brought me to the first pool. I got rid of my yukata at the locker room (make sure to go into the correct one! 男 is the sign that will guide men through the right door) and quickly splashed myself with some hot water from a fountain next to the door. And then I was ready to submerge myself in the warm water – listening to the foaming gargling of the mountain stream in the most relaxing setting I could ever have imagined! This might be a good opportunity to mention that the pools at Takarawaga-onsen are open for both sexes. This means the usually very strict bathing rules are a bit softened. Women are allowed to cover their private parts with a large towel wrapped around their torso, while men are allowed to use the regular small onsen towel to cover their modesty. I’ll willingly admit that I was glad about that. Despite my many travels, I would call myself a very shy guy. This, however, did not keep me from trying out the many other pools at Takarawa-onsen. Desperately holding the way too small towel in place around my hips, I waddled on to the next onsen just a few meters further downstream. Other than the scenery and the view, I honestly could not notice any difference whatsoever. I do not mean that negatively, though. This pool was just another example, why I think Takaragawa-onsen is probably the best onsen in Japan. There was just so much space! I’ve been at quite a lot of onsen in my life and usually, all you get is a pool barely larger than an average bath tub. If you are very lucky the pool will be outside and will not be surrounded with ugly yellowish tiles you thought prohibited by law since 20 years. (just in case you don’t believe me: Check out regular onsen here). 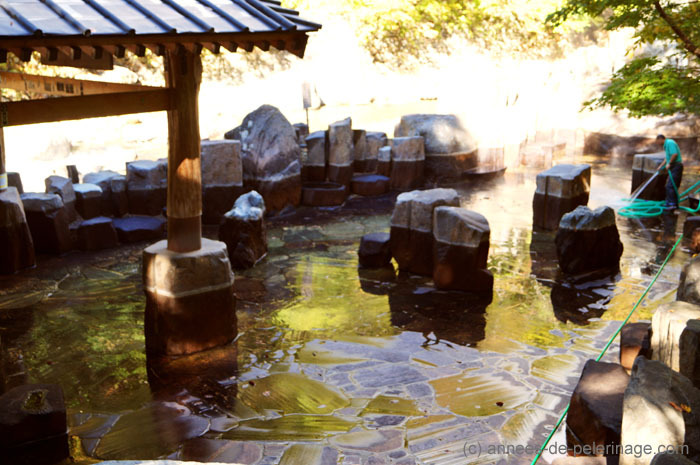 The pools at Takaragawa-onsen, however, are not only nestled among the natural mountain rocks, they are also lined with them and get cleaned daily. So by comparison, it explains why my review of Takaragawa-onsen is so very favorable. It is really unique. After having thoroughly soaked myself, my wrinkled feet guided me, a little dizzy from the heat, back to my room. I had a little balcony looking over the mountain stream and decided to spend the remaining minutes before dinner enjoying the solitude reading a book. Dinner, then, was served in a spacious dining hall down in the basement. I never could figure why in some Ryokan it is served in your room and other times in a dining hall. To me, it seems quite random. But anyway, there I was sitting on low chairs and a true banquet arranged in front of me. Sizzling coals to grill fresh fish, a basket full of pickled vegetables, a steaming pot with a meaty soup and even some fresh sashimi – so much in fact that I barely managed to eat half of it and still felt close to exploding. (What you can see on the picture is just the first 3 courses – 4 more followed). The dining hall itself wasn’t especially pretty as you can see, but the food was very delicious and definitely worth remembering – and certainly not only for its quantity! And now comes in the best part about Takaragawa-onsen: the pools are open throughout the night! So after dinner, make sure to steam away those extra calories. Muted lights will create an almost magic atmosphere you do not want to miss. I certainly couldn’t resist the beckoning call, all aware that my skin was still totally wrinkled from my visit in the afternoon. I really have to stress that Takaragawa-onsen is somewhere in the middle of nowhere. There are literally just the buildings of the ryokan and nothing else. The next settlement is a 10 minutes ride by car away and not especially worth seeing. The shops at Jomukogen-Station are the closest thing you might want to call civilization. They sell some sort of vapor-steamed chestnut sweets the place is famous for. But weirdly enough every town in Japan is more or less famous for some kind of sweets, so I wouldn’t make too much of it. The hotel bus will stop there for around 15 minutes on your way to the Ryokan – that’s really all the time you will need to see it all and buy yourself a little omiyage (= souvenir in Japanese). But that doesn’t mean there is nothing else to do. 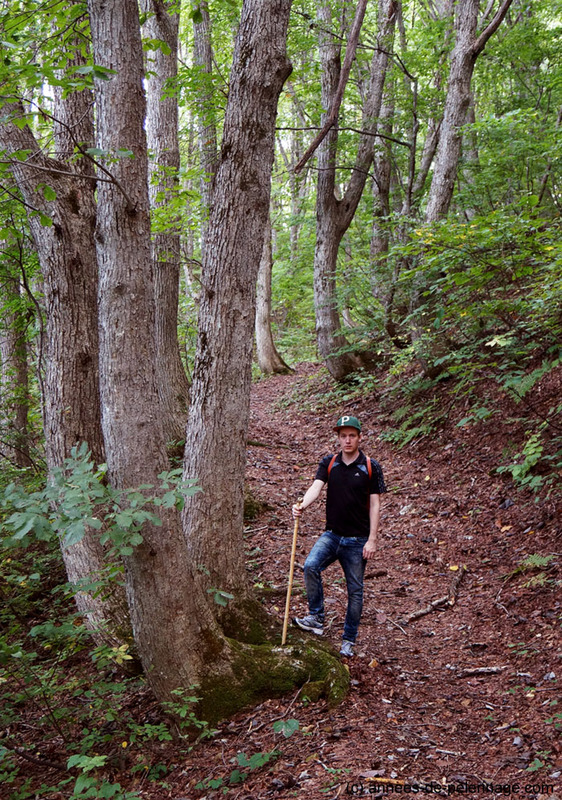 Quite to the contrary: Takaragawa-onsen is located in the middle of the mountains and you can go hiking there. 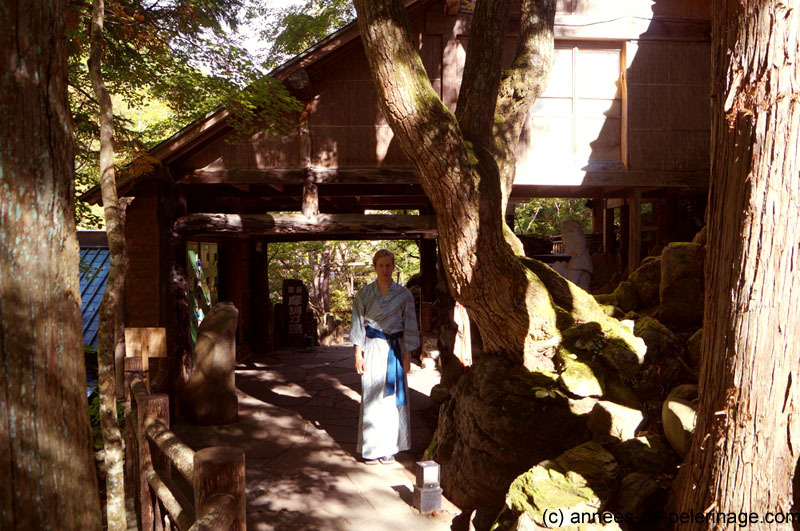 In fact, there is a very beautiful path leading to a viewpoint branching away right at the main entrance of the Ryokan. The fun part: the hotel staff gave me a little walking stick. Now I really didn’t need that. There was, however, a bell attached to the top (supposedly to scare away the monkeys; might explain why I didn’t see any). Every step I took on my ascent tickled a chiming sound from the cane and created a strange, yet welcome spiritual atmosphere. The winding path led me through a beautiful forest and across many small bridges. Roughly 30 minutes later I reached the viewpoint, where a little memorial to some forgotten someone marked the highest spot. Do not expect something all too spectacular, but rather just a nice overview of the surrounding mountains. 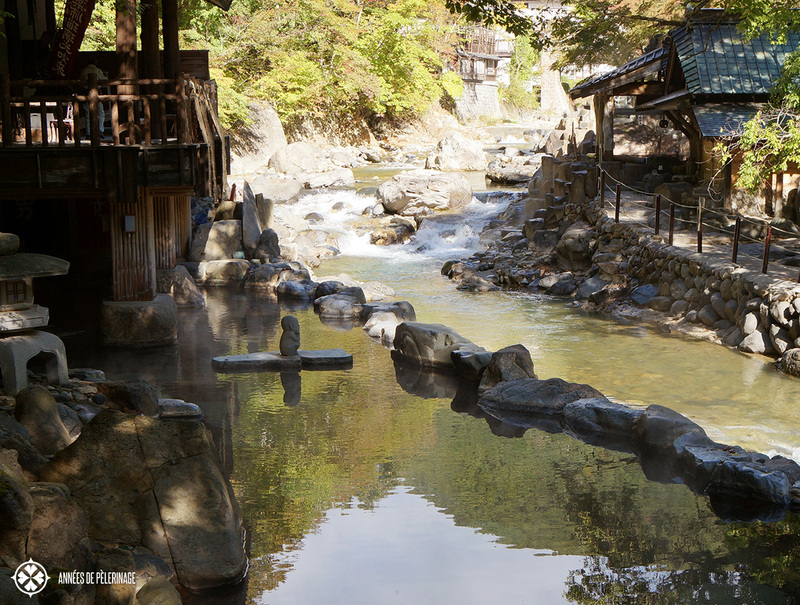 The rotenburo (=Japanese word for outdoor onsen/hot springs) of Takaragawa-onsen are truly outstanding. There are few places in Japan where you will find such large outdoor pools and certainly not as many of them. 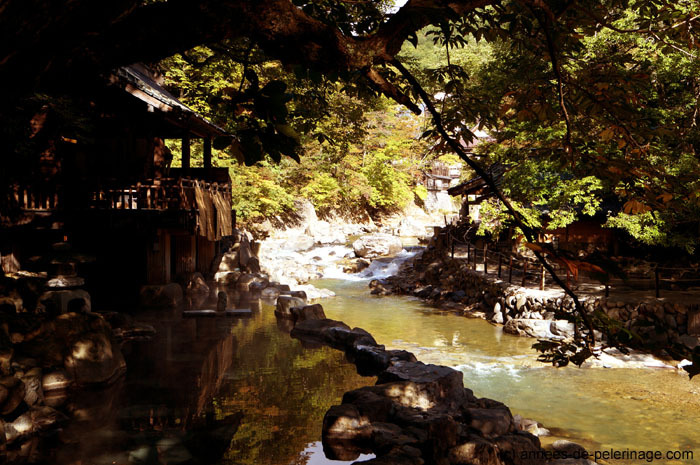 And none (that I know of) flank a scenic mountain stream like the Takaragawa-onsen. They are clean, everything seems new and spacious (weird as it may sound –this is quite rare!). Temperatures vary from cooking hot to moderate warmth at the natural outflows of the pools. There is even a special outdoor pool hidden away behind big screens only accessible for women. The pools are warm enough to enjoy even in bad weather or winter (though you will have one traditional onsen inside the building as a fallback – one for men and one for women). The food at Takaragawa-onsen is worth a notice as well. Do not underestimate this fact! Staying at an Onsen-Ryokan really is only about eating and taking a bath. If either is not up to your standards, the whole experience will suffer tremendously. That being said, the newer additions to the Ryokan at Takaragawa-onsen are somewhat shabby (sorry, didn’t take a picture). Also, the onsen is famous for its bears, which are held in very small pens. I heard that some western tourists found that extremely repulsive. I, however, am a little bit more pragmatic about that. You have to respect different culture and different takes on domestication. There are, after all, many customs Japanese will find equally horrifying when they visit us. If you want to experience spacious outdoor pools in an outstanding location close to Tokyo, Takaragawa-onsen and it’s hot volcanic water is the place to be. If you are expecting a pristine luxury hotel, you might decide to skip your onsen-experience altogether and rather decide for a 6-star spa hotel somewhere else in the world. I found it to be worth the trip and will definitely go there again – and I am really a spoiled brat when it comes to hotels. For me, it’s the best onsen in Japan. Now a review of Takaragawa-onsen wouldn’t be complete without some helpful tips. So please know that there is no need to bring your own towels, yukata or other hygienic products. Like in any other Ryokan everything you would need for is provided (that’s the reason you will see Japanese tourists arriving with little more than a bag containing a spare t-shirt). European men, however, might consider bringing their own onsen-towel. The standard ones are issued with Japanese men in mind, and they have usually half as small hips as you. Even I, weighing around 65 kilogram, barely was able to fit it around. Some tourists might get confused with the clothing rules. You will feel most comfortable wearing the hotel yukata (you got to choose size and color, so don’t worry) wherever you go. 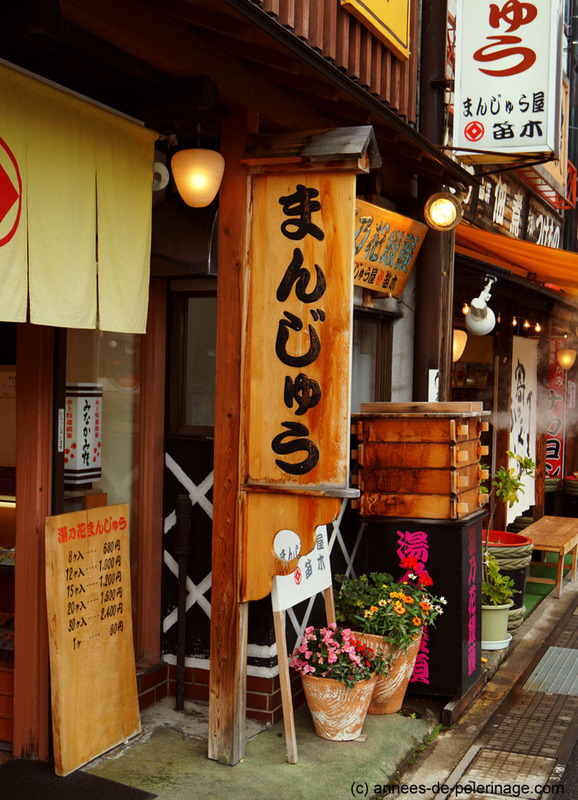 With one exception: most Japanese tourists will only stay one night. Either way, they will depart right after breakfast, which explains why nobody will be wearing a yukata in the morning. So wear the yukata for dinner and normal western clothing for breakfast, to save you from too much staring. Last but not least: Don’t forget to explicitly book a non-smoking room! Japan is probably the only country in the world where hoteliers still allows indoor smoking – and you really don’t want to smell the cold smoke from a decade’s worth of cigarettes while sleeping. 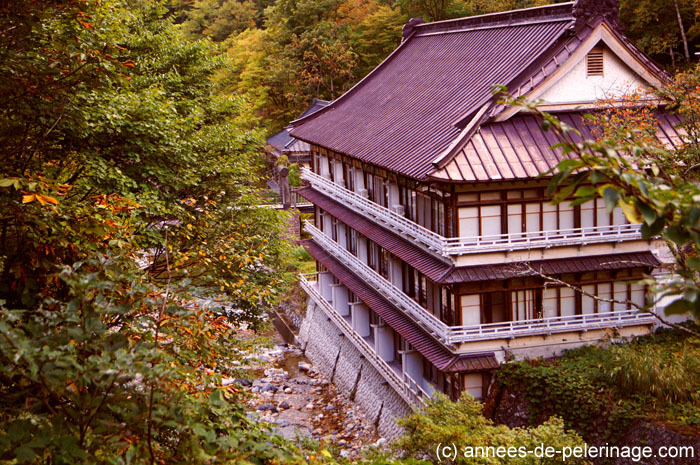 Also be aware that, like probably all better Ryokan, Takaragawa-onsen will be crowded on the weekends and mostly empty during the week. So that’s it! 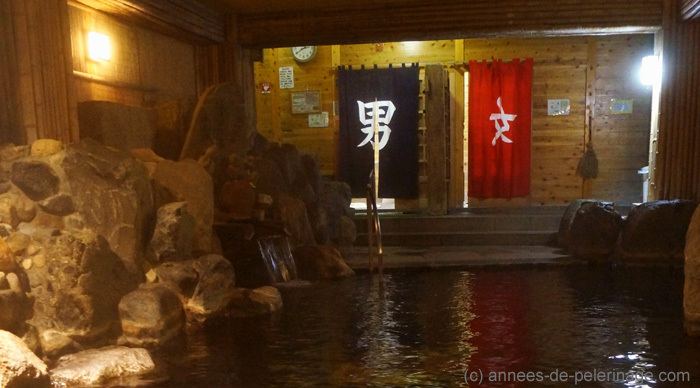 I hope you enjoyed my little review of Takaragawa-onsen – arguably the best onsen in Japan. If you have any questions regarding Takaragawa-onsen make sure to let me know in the comment section below! 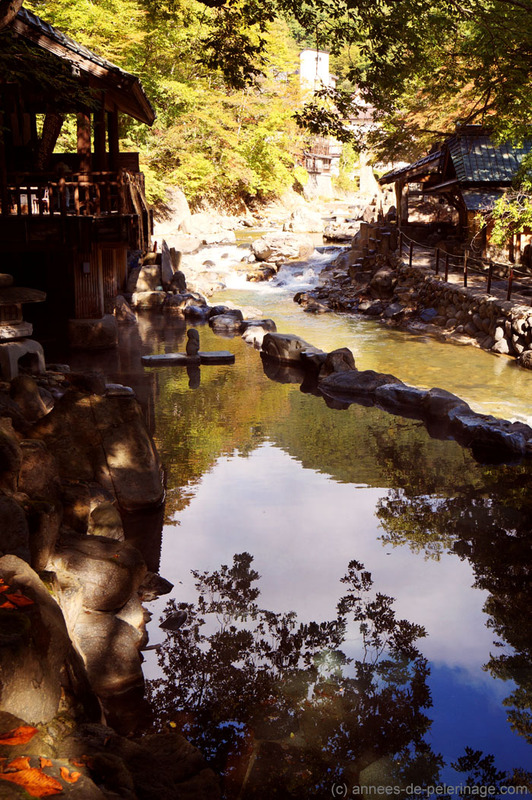 Can you visit Takaragawa Onsen and just pay a fee to use the hot pools? We are thinking about renting a campervan to tour Japan. that is quite possible. As with every other onsen in Japan you can get a visitors ticket as well. Does anyone mind if you take photos there? I’m in Japan at the moment and am thinking of paying a visit, if only for the food and to take some photos of the outdoor pools amidst the buildings and the snow. Strictly speaking, taking pictures is not allowed! This is the reason why I didn’t take pictures of any people soaking away in the pools. The pools are open almost all around the clock. Thanks. How did you manage to get your shots of the pools and river? Looking at the water, that would have required not just a camera, but a tripod too. Or is the pool that’s shown (with all the lights and right next to the river) not actually one of the bathing pools and not off-limits? That pool seems to show up a lot when I search for photos of Takaragawa onsen. I only use tripods for long exposure stuff, as I hate carrying them around on my travels – just too cumbersome, even tho I got a very good carbon one. I am producing television programs in Japan. My name is Asuka Trautmann, TV Asahi. 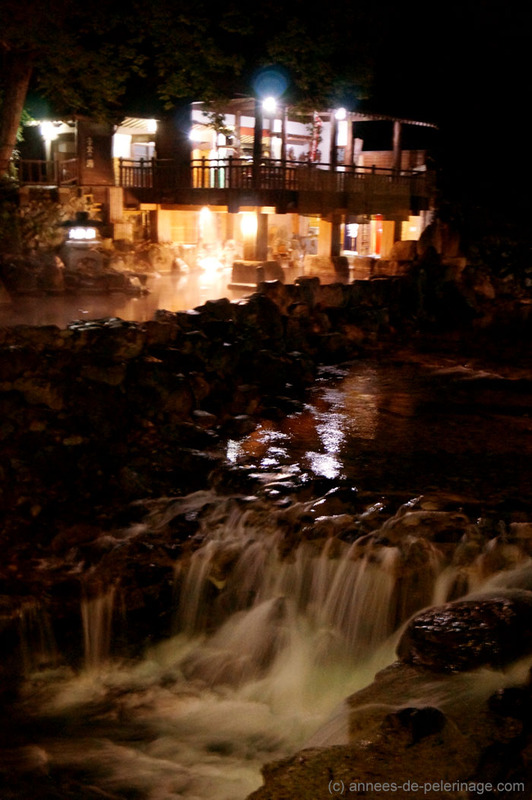 I found a web of Takaragawa Onsen by introducing foreign tourists. Would you let me use WEB page by all means on TV? We are looking forward for you reply. thank you for contacting me on my website. I’m not sure how I can help you. You contacted me regarding my blog article on Takaragawa Onsen / 宝川温泉汪泉閣. You said you wanted to use my web page on TV? Could you please explain? Thank you so much replay! and corporation!